Creative business meeting of mixed race team. Woman team leader presenting to group of people new idea at modern office. Female team leader brings documents to creative business team. Mixed race group of people meeting in modern office. 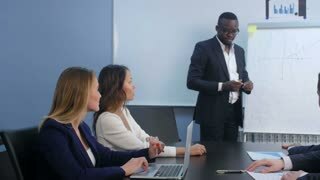 Woman team leader comes up, gives instructions to colleagues at multiethnic business team meeting in modern office 4K. Positive African American male team leader laughs at multiethnic office team business meeting discussion slow motion.